One of the highlights of the Telluride Patient Safety Summer Camp was the in-depth discussion of the meaning of informed consent. It is not as straightforward as “here, sign this”. In fact the paper consent itself is in a sense the last and least component of informed consent. I was a bit surprised and secretly glad to hear some places have rid themselves of the informed consent form, which reinforces the notion that informed consent is some kind of administrative scut to be dished out to residents. Informed consent isn’t extra, it isn’t something for special procedures, it really should be an integrated part of every doctor-patient relationship. The heart of it is shared decision making and coming to the best course of action based on the patient’s preferences, values, needs, and goals. (“Preferences, values, needs, and goals” was in fact one of my takeaways – a mental checklist worth committing to memory.) Granted, we do have a long way to go in learning the best way to approach individual patients. The ideal of informed consent and shared decision making poses a number of difficult issues. For example, people don’t perceive risks and benefits in the most rational way, especially when presented as numerical probabilities. Further difficulties arise when patients are in some ways incapable of truly understanding certain risks because they do not live in the healthcare world. They haven’t seen what it’s like to be in the ICU for a prolonged stay with a “complicated post-op course”. And of course, there is the perception that risks are things that happen to other people, but not to me. Again – I think we have a good idea what the ideal of informed consent looks like, but the issues presented in getting there are a different story. That said, the issue of publishing infection rates comes up in the context of transparency. In fact, infection rates have everything to do with informed consent, too. If I’m having a procedure that puts me at risk for infection, wouldn’t it be nice to know exactly how much risk I’m undertaking, particularly from hospital to hospital? Sure, I could find some bulk statistics for the infection risk of the procedure in a textbook (or government website) somewhere, and that information is likely to be outdated. If I’m having the procedure done at hospital X, then the most accurate estimate of my true risk of infection will most likely be the actual rate of infections at hospital X. If a hospital has enough volume of a certain procedure, they ought to track their own complication rates. It’s more than just transparency, it’s about being as honest and as forthright as you can, and providing patients with the best, most accurate and up-to-date information about what kind of outcomes they can expect when they come to your hospital. About a month ago, I was sitting in on a clinical correlation led by an aneurysm neurosurgeon and his patient at the Johns Hopkins Hospital. These clinical correlations are incredible opportunities for medical school students to learn directly from the patients themselves by hearing their story and then asking them questions. During this particular clinical correlation, the neurosurgeon discussed the importance of informed consent and the decision making process that stretches over several weeks. The decision to undergo a surgery and which neurosurgeon requires deliberation and time. In the clinical correlation Q&A, a classmates asks the neurosurgeon, “What number determines competency?” It, of course, varies due to a number of factors, but 50 was thrown as a minimum number. My classmate then re-raises his hand. It was a very legitimate question. One I had asked myself. In these past couple of days, I have witnessed what happens when physicians fail to uphold their responsibility to their patients. Michael Skolnik was a young teenager that died unnecessarily because a neurosurgeon did not provide true informed consent. He did not disclose to the Skolniks that he had only done two cases prior to Michael’s. Furthermore, the neurosurgeon did not take the time to discuss the risks of the surgery and alternatives to the craniotomy. To Skolnik’s neurosurgeon, informed content meant a mere signature and 15 seconds of his time. A life was lost because of this missed conversation. It was a heart wrenching story, and I felt ashamed for my profession. Telluride Patient Safety Roundtable forced us scholars to face these necessary truths. That lives are lost when we view informed consent as an annoyance rather than a responsibility we owe our patients. Residents have been frustrated with me in the past, saying I don’t let them do anything. But that’s because they cannot do the procedure at the standard I demand […] I do believe some residents can become as good as me. They may not be able to do it as quickly but they can certainly achieve the same level of proficiency […]. Aneurysms are not for everyone. I’d be happy to refer to them to a career counselor. When I first heard his response, it was with mixed emotions. I understand how dangerous aneurysms are. But wasn’t that a bit harsh to imply a career change? After hearing Michael Skolnik’s story, I recall this answer with fresh perspective and humility. This Johns Hopkins neurosurgeon demanded a standard of care we all owe our patients. How would I feel if a neurosurgeon killed my little brother by refusing to acknowledge his shortcomings? Yes, we all have to learn – but not when lives are at stake. And if we’re not good enough, maybe we shouldn’t be holding the scalpel in the first place. I just returned from an amazing week in Telluride where I not only learned a lot but was also inspired and reinvigorated by the group of colleagues and faculty I met. One of the most surprising things about the week was that despite our varied backgrounds and geography, we all came together with a common set of interests and experiences (sometimes bad ones) determined to make changes moving forward in our practice. Thank you to everyone I met this week. 4.) Culture eats strategy for breakfast. 5.) Patients who end up in the “wrong ward” are often the most vulnerable. 6.) Your greatest enemy is complacency. 9.) Knowledge is power. Your job is to transfer this power to the patient. 10.) Once you have made your point, shut up and listen. 11.) Seek first to understand and then be understood. 12.) Holding “patient safety event reviews” focused on resident education rather than RCAs, may be a better way to achieve buy-in. 13.) If you want to report something, but the other person involved is resisting, write it together so there will be no misunderstandings or division of blame. 14.) Reporting a patient safety concern is about the INCIDENT (and the harm or potential to harm) not the individuals involved. 15.) There is a role for situational leadership in healthcare. You lead differently on a sinking ship vs. when making changes about parking at the hospital. 16.) Leaders do not make excuses, they build solutions. 17.) Some is not a number, soon is not a time. 18.) As physicians, sometimes we take steps to treat ourselves and not the patients. 19.) Build trust by saying what you are going to do, and then doing it. 20.) Problem-solving is one of the main barriers to listening among doctors. We need to be cognizant of this when we find ourselves tuning out. Today’s final discussions revolved around what three tangible things we as residents can do when we return to our respective programs to improve shared decision-making and improve our ability to communicate in the case of patient harm. I was very encouraged that there was actually very little variation from each of the breakout small groups. We all seemed polarized to some very clearly defined, and what seemed like obvious, solutions to improved patient safety in our respective corners of the world. The opportunity that I see after completing this exercise is that although we can all make small incremental changes in our respective practices, how can we reshape the practice of medicine to make our small individual changes part of a bigger and more permanent cultural change? If all 28 of the scholars would communicate with 10 colleagues about the importance of shared decision-making and informed consent we could make a small change. But if we made our goals for next week bigger and decided to change the entire process for all residents for generations to come, we may succeed in making lasting change and forever changing the practice of medicine related to these issues. Considering the very talented group of resident scholars that we have, I believe that we could make broad sweeping changes to the practice of medicine. Although these changes would not be easy and would take time, diligence and perseverance, we really have nothing to lose. It would be incredible to leave a mark on the culture of medicine that would be lasting. There is a concept of a massive, almost unachievable goal that is called the BHAG. For those who are not familiar with this, I would encourage you to learn about it. The acronym stands for Big Hairy Audacious Goal. Why not make goals as big as you could imagine. The worst that could happen is that you did not achieve the goal and would fall short, but this would be so much more monumental that making a manageable goal that would not likely expand your skills, knowledge or make a lasting change. In the upcoming weeks and months, I challenge my fellow residents to think big. Think outside of the box. Imagine what would be your ideal for patient safety and work as a team to create initial steps toward these goals. I am enthralled at the concept of ” shared decision making ” because it puts back the patient at the center of the medical universe. Sometimes there is a tendency to be paternalistic either consciously or unconsciously when dealing with patients. This is a pearl of wisdom that I will be taking away from Telluride. It enhances patient care, empowers the patient and protects the physician to some degree. It is win- win situation for all parties involved. After this afternoon’s discussion about shared decision-making, I wanted to share my list of three things I plan to do when I get back to Boston next week to improve the shared decision-making process for my patients. Patient-centered rounds on the wards: This approach to rounds encompasses a lot of the simple yet brilliant concepts we discussed such as: introducing yourself, your team, your roles, and the purpose of the encounter. Presenting at the bedside to allow the patient to correct mistakes or add to the story. Discussing the differential and the plan at the bedside, which allows you to communicate this not only to the patient but also to the other team members. Carry the marker: I shared with my small group that there is a whiteboard in each of our patient rooms with a fill-in-the-blank “My goal for today is___.” How many patients use it? None. Why? Barrier #1 is the complete lack of markers in the rooms. There are probably numerous reasons for this, but there’s nothing stopping me from bringing my own marker in my white coat on rounds to allow my patients to not only voice but also record their goal for the day. Identify and advocate for the high risk patient: The principles we discussed today apply to all of our patients, but we all know that there are especially vulnerable patients who may get lost in our healthcare system, or even worse, might get harmed and not even realize it. The 80 year old slightly demented, deaf, non-English-speaking Cape Verdean woman who doesn’t read and lives alone. The 30 year old man with a history of opioid dependence recently released from prison, now homeless, jobless and without social support. These are the patients for whom we as residents, primary care providers, and as patient-safety champions need to act as advocates when no one else will. I hope by sharing this list I will feel even more accountability to make these changes and that maybe some of you will also be inspired to share your list too! Getting to discuss the concept of High Reliability Organizations: What blew me away is the fact that the health care industry is so far behind when compared to aviation. With 36,000 flights per day, 2 million passengers and no adverse events versus in healthcare where 20 – 33% of patients admitted to US hospitals being harmed during their stay. For an industry that spends ~$2.7trillions dollars a year and wastes ~$750 billion we should do better. Let’s face it–we definitely have the resources to implement systems that would decrease harm, as well as the commitment, passion and desire to do so. So why can we get it? That is the million dollar question. But I feel confident that initiatives like the Telluride Patient Safety Roundtable will provide and empower us with the tools we need to achieve our common goal to decrease harm and provide quality and sustainable care for generations to come. The Roundtable will also help us to become the educator and advocates our patients need. Our photo session was fabulous. We spent time in the good outdoors of Colorado, played some 3-on-3 basketball which was awesome, and our team building exercise was eye-opening. It was good for loosening people up, building basic trust, and creating an effective process to prevent harm to our egg-headed patients. Finally we were divided into groups to discuss what would we do to improve shared decision-making, and what we can do to improve the conversation related to harm. All groups had an excellent perspective about changing and improving both aspects of patient care. We were all on the same page and this makes me so optimistic that there is light at the end of tunnel for the safety of our patients. This roundtable changes mindsets. It has definitely changed mine and we are only into the first half. I can’t wait for the second half of this life changing experience. 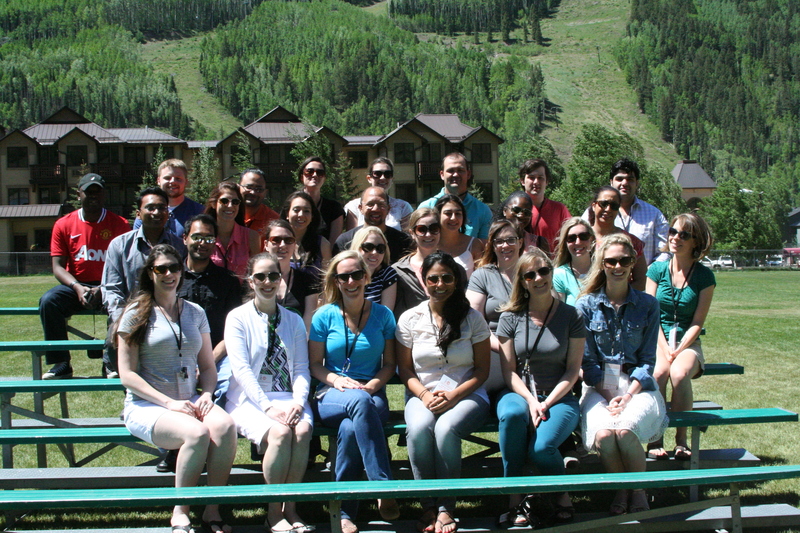 Shout out for the Committee of Interns and Residents for the opportunity and to the Faculty of the Telluride Patient Safety Roundtable for this enlightening experience. Another solid day at the conference. As the residents and guests have gotten to know each other and become more comfortable, we have become more engaged in serious conversations about patient safety. Very sobering, yet eye-opening video about Michael Skolnik this morning that initiated some good discussion for the rest of the day. As I watched, I couldn’t help but find it interesting how the viewer sees it easy to blame, and even villainize, the neurosurgeon who performed the consult. Yet so many, including myself, have had flawed experiences with consent. Our culture makes it so easy to make these mistakes and get away with it. Honestly, we can all relate to some form of that physicians actions during the case. On that note, I am planning on taking many of the ideas discussed in the small groups back to my program. Common themes included transparency and empathy throughout the process. One topic I find myself continuing to ponder regards the follow-up with a patient after a mistake has been made. Being a family medicine doctor myself, I wonder if it is my responsibility as the PCP to play this role. Then again, what if I am not the one who made the error in the hospital and had nothing to do with the adverse event? Overall, a great, productive day and I am looking forward to Wednesday! There is nothing more powerful than a personal experience. Helen Haskell represented this at the Telluride Patient Safety Roundtable. Her son, Lewis, died of medical misdiagnosis which inhibited the team from providing appropriate life saving treatment, his story was recounted in a video produced by Drs. Mayer, McDonald and the team at Solid Line Media. The story and the courage Helen has to continually attend the conference and provide a first-hand experience of an unsafe medical system was by far the most memorable things about the week. There were lots of memorable things about the week, including the views from the gondola required to scale the mountains and the dedication of the faculty members, but Helen’s story will continue to stay with me. I am hoping that her son’s memory can act as a guiding force for all of us. A memory we can return to when we have lost our way along the road toward patient safety. A memory that will guide us back toward putting the patient and family as the center of our care if we go astray due to personal, family, financial or others factors. In the beginning of medical school, I was astounded by how many of the students were truly good people, they were caring people with big hearts and understanding minds. Research shows that our empathy decreases as our medical education progresses and reaches a nadir by year 4. I can only assume that it continues to fall as we take on the responsibilities of internship and balance this with the desire and responsibility of starting a family, being a good son/daughter, neighbor and colleague. I hope that Helen and Lewis’ story counteract this passivity and continue to call us toward our original goal of helping others, which, as the Hippocratic oath correctly details, first requires us to do no harm. On neurology rotation I saw a case that exemplified a large number of the topics we discussed at the Telluride Roundtable this year. This was the case of a 71-year old woman that came in for an outpatient endoscopy with dilation for a post-surgical esophageal stricture. During the procedure she desaturated and was intubated within minutes. The procedure was suspended and physical exam at the time showed no apparent life threatening abnormalities. Within 2 hours the physical exam showed anisocoria with the right pupil dilated to 4 mm. A stat CT scan of the brain showed “bubbles” within the cerebral veins as well as extensive cerebral edema and evidence of an uncal herniation with compression of the left cerebral peduncle. Mannitol was run, the head of the bed elevated to 30 degrees, a central line was placed, the ventilator settings were changed to hyperventilation protocol and an FiO2 of 100%, and an extra ventricular drain was placed. Despite these measures the patient continued to develop cerebral edema and had intracranial pressures into the triple digits throughout the night, she was declared dead by brain criteria the following day by our team. I call this a poor outcome rather than an error because our attending found a report of 20 such cases in which air embolic strokes occurred during or after procedures that require insufflations (endoscopy, laparoscopy, colonoscopy etc). This then becomes a rare but known complication of the procedure which made me think of the informed consent conversation we had during the roundtable and of Michael Skolnik. I was fairly sure that no one informed the patient of the risk of air emboli infarcting her brain. The pathogenic theory is that microscopic tears in the viscera allowed air to enter the esophageal veins, traveling to the IVC and through the lung vasculature to the systemic circulation (via pulmonary arterial-venous shunts). We believe that the patient’s desaturation was secondary to pulmonary emboli from the same mechanism. Does this a represent a reasonable risk that the patient deserved to be notified of? I don’t know. Twenty cases is not a large number, but the published case reports most likely underestimate the true incidence. Would I have wanted to be informed of this prior to the procedure? I don’t know. I would have had to weigh the risk against the potential benefit. This is the essence of shared decision making –giving the patient the facts and allowing them to ascribe their value assessment onto those facts and arrive at a logical decision. Without knowing this patients baseline I was left feeling only sad for the outcome and the loss of innocence that occurs when something so precious is lost- a life and a trust in the medical community. I am glad that the patient’s husband did not see it this way, I am glad that he maintained respect for, and trust, in the doctors caring for his wife. When my grandmother died of hepatic failure after taking the antibiotic Trovan ®, and the drug was subsequently pulled from the market due to risk of liver toxicity, I started to question my faith in the medical community. I became committed toward the application of sound evidence to the relief of human suffering. My faith in the medical community was restored slowly over my first two years in medical school as I learned that most physicians operate with very good intentions but in a complex environment which is not readily transparent or controllable. The derogatory based jokes I heard during my third year (while I know not ill-intended) started to erode at that faith again. Attending the Telluride Patient Safety Roundtable completely renewed my faith in the medical community. I was inspired by the fact that such successful professionals take the time to teach medical students basic leadership and patient safety goals. In every conversation and action I could tell that they had the patient’s best interest as their primary goal. They renewed my faith in the medical community not only because they are true role models –individuals that I aspire to emulate, but also because they taught us how to lead the medical community into a more respectful patient driven culture, and I now know we can do it!